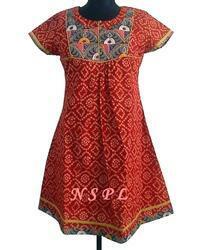 Backed by market good will, we are engaged in offering Traditional Ethnic Kurti to our clients. Our offered kurti is made from best quality fabrics that are procured from reliable vendors and designed with various attractive traditional prints. Owing to its nice appearance and soft texture, it is widely preferred among our clients. We bring forth a rich collection of Bandhej Print Kurtis especially for our esteemed clients. Our offered kurti is crafted from industry grade fabric materials that are obtained from the trusted and certified vendors of the market in compliance with industry quality standards. 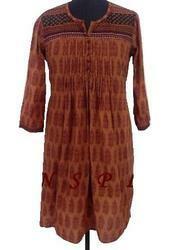 The offered kurtis are available with us in various attractive colors and popular Jaipur bhandhej prints. 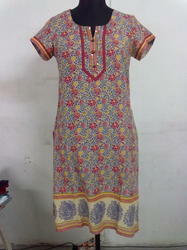 We put forth a wide range of Ethnic Kurtis to the clients. Our offered kurtis are fabricated from quality approved fabrics and modern techniques in accordance with the defined quality standards. Our entire series of kurtis is elegantly designed by our skilled craftsmen keeping in mind the emerging fashion trends while designing these products. 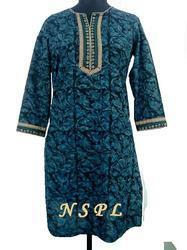 We are a reckoned name engaged in offering Panel Print Kurta. Designed by our highly skilled craftsmen in accordance with the latest fashion trends prevailing in the market, the entire range is available in various attractive prints and sober colors as per our clients’ choices and preferences. Thereby, they are most preferred and famous choice of our clients.